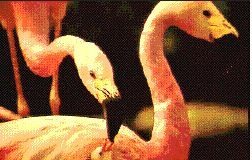 Since the demise of Aves, the FTP archive of ornithological images, many of the pictures previously housed there have disappeared from the electronic horizon. We offer a small assortment of images formerly found there. The thumbnail images are linked to larger versions of the pictures (usually 20-30 K in size) which you can download. Notes : Breeds on subantarctic islands. Also in small numbers on Horn Island in Chile, Staten Island in Argentina and in the Falkland Islands. Wanders casually to the Straits of Magellan. 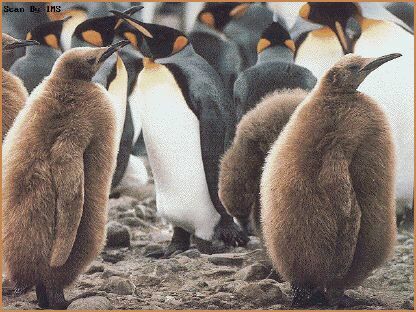 Differs from Emperor Penguin (Aptenodytes forsteri) in shape and colour of circular orange patch at side of head. Size : 30 cm. wingspan 71 cm. Range : Rarely seen away from its breeding island; another subspecies, (caledonica) nests in New Caledonia. Post breeding dispersal mainly into the Tasman Sea and adjacent SW Pacific although stragglers have reached New Zealand and even the Galapagos. Notes : This bird breeds only on one island (Cabbage Tree Island) off the coast of the State of New South Wales, Australia. Total number breeding each year is about 140-150 pairs, of which 30-40 produce a fledgling chick. Bird is endangered because of the sticky seeds of the native Bird-Lime Tree (Pisonia umbellifera) which get caught up in the feathers of the young and cause them to mat, incapacitating the bird and making it easy prey for the local Ravens. Does not usually follow ships. Flight recalling small shearwater with shallower flight peaks, but often adopts erratic bat-like weaving, sprinting high over the ocean. Range : Circumpolar (South Pole) Breeds in Tasmania and the Bass Strait area of Australia and on Aukland Island in New Zealand. Found in the Southern Ocean north to about 25 degrees South. Notes : Breeds colonially on oceanic islands; follows ships and attends trawlers. 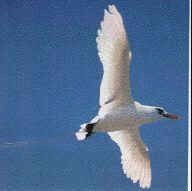 Its gracefull and effortless flight recalls that of the Wandering Albatross. 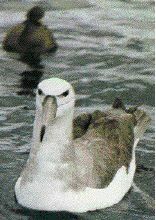 There are three subspecies of Shy Albatross: the nominate form, the Salvin's Albatross (D. c. salvini) and Chatham Island Albatoss(D. c. eremita). Range : From SW Peru south through Bolivia and portions of Chile and Argentina. Notes: Nests colonially on ground in conical nests built of mud. Voice is loud and goose-like. They are wary and seldom allow a close approach. They are found on highland salt lakes, descending in the winter to brakish estuaries and coastal marshes. They feed on minute algae, molluscs and diatoms. Notes : Dives with half folded wings to capture fish & squid. Mated pairs have a characteristic hovering display flight. 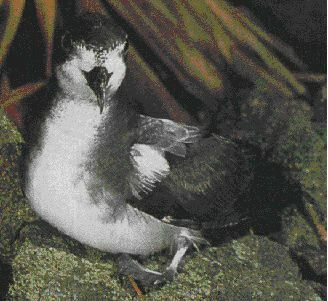 Nests on ground on atolls or on coastal cliffs. More pelagic than other tropicbirds; often seen far from land. It nests in the Hawaiian Islands, Marianas, Kiribati, Rose Atoll, Fiji, Tonga, the Cook Islands, Tuamotu Archipelago, Tubai Islands and Pitcairn. Notes:This attractive bird of open grasslands was formerly shot in great numbers for food and sport until it became very scarce. Now given protection it has increased once again. 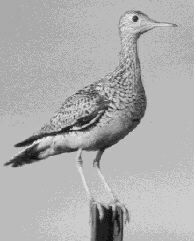 It often flies with wings held stiffly downcurved like a spotted Sandpiper, especially on its nesting grounds. Notes : One of the most brilliantly coloured birds of the Holarctic region. Call a loud shrill penetrating 'cheee' or 'chikee'; song rarely heard, a whistling trill. Lowland fresh water of all kinds, in winter also on estuaries and sea coast; dives either from a perch or while hovering to catch fish, aquatic insects and other small animals. 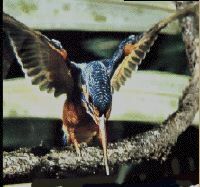 Flight is fast and consists of whirring wingbeats interrupted by brief glides. Nests in sand or earth banks where it excavates a nest tunnel up to a meter long. Range : Southern Canada to Gulf States. Winters from Mexico to Panama. Notes : The only hummingbird breeding east of the Mississipi River. It lays two eggs the size of peas in a nest of plant down held together with spider silk. It is covered with lichen and placed in the fork of a tree, usually in a forest clearing. They feed extensively on the nectar of flowers. Insects and spiders also form a significant part of their diet. With their remarkable powers of flight, hummingbirds are the only birds which can fly backwards as well as hover in place. Range : In many portions of southern Canada, throughout much of the United States south through the central mountains of Mexico. Resident in most of its range except for areas in central Saskatchewan and Alberta where it is found only in the winter season. Notes : Common in deciduous woodlands. Except for the white throat it resembles a chickadee in plumage, though not in shape and actions. Call a low yank-yank. Song consists of 5 to 15 low rapid notes given 6 to 15 times per minute. Range : Eastern North America, Mexico, Belize to northern Guatemala. Notes : Male. Common in hedgerows, wood margins, suberbs and desert washes. Song is a repitition of loud slurred, whistles, 5-10 per minute. 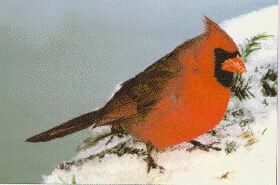 This species, named after the red robes worn by Roman Catholic Cardinals, has extended its range northeastward into Canada in recent decades. Notes : Locally abundant in conifers. Irregular in the southern part of its range. Partial to sunflower seeds. Usually flies in loose flocks; note the undulating flight. The most frequent call is a loud, House Sparrow like chirp. 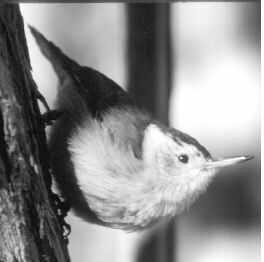 This species formerly bred no further east than Manitoba, but more food available at bird feeders may have enabled more birds to survive the winter, and the species now breeds east to the Atlantic. Range : North America south into northern Mexico in winter. Notes : Irregularly common in large flocks, especially in conifers. Its distribution and population vary considerably from year to year depending on the extent and distribution of the northern cone crop. 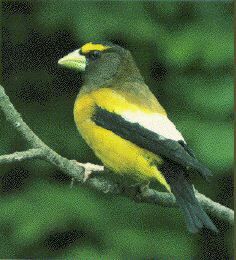 In form and actions they resemble goldfinches, with which they often flock. Tame. Its wheezy voice is diagnostic.